My mom is a great cook. She regularly takes mundane ingredients and turns them into healthy food that’s so tasty you ask for second helpings. Me? I’m still learning. But I absorb the recipe better when I can SEE the dish being made. I need to copy the steps. That’s what we do every day. Copy someone else. We brush teeth after meals because someone showed us how. We clean the windshield at the gas station because that’s what dad did. We wear shirts tucked in or pulled out because our favorite celebrity wears them that way. We absorb life lessons and habits unconsciously because we see them every day. Good habits and bad habits become ingrained pretty quickly. It only takes six weeks for a behavior to become a habit. That’s why it’s so difficult to break a bad habit. You don’t get rid of a bad habit. Instead, you learn a new, good, habit to take the place of the previous behavior. 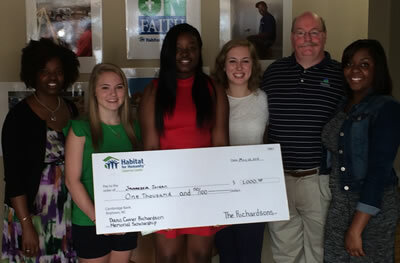 On May 28th the daughter of a Habitat for Humanity homeowner received the Dana Connor Richardson Memorial Scholarship. Janaesea Jordan dreamed of a career as a registered nurse before her mom Kenya Jordan entered the Habitat program. After watching her mom study financial literacy and acquire budgeting skills – what did Janaesea learn? Observing Kenya on the construction site week after week, what lessons did the daughter take away? Dana Conner Richardson, the former Program Director for Habitat for Humanity Cabarrus County, was deeply committed to the elimination of poverty in Cabarrus County. As the first college graduate from her family she strongly believed in higher education. After Dana lost her battle with cancer, her family started the scholarship as a legacy to her beliefs and commitment to her community. There is a fable about a father crab instructing the baby crab the proper way to walk. The parent crab kept saying things like, “Why are you walking sideways? Don’t you know you should walk straight? Try to walk like me!” The moral of the fable was that children learn more from example than by telling. Kenya’s daughter will apply the lessons she learned from watching her mother realize the dream of home ownership to pursue her own educational aspirations. She will study at Winston Salem State University beginning this fall. Brent Richardson and his children, Meredith and Lindsey, renew Dana’s commitment to her community through the scholarship in her name, which is awarded annually to an immediate family member of a Habitat for Humanity Cabarrus County partner family to obtain education beyond high school. Learn more on our website.